Social media monitoring and social media listening are terms that have been used interchangeably, but there is a difference. Social media monitoring = Caring for your customers by monitoring social media for messages directly related to your brand and responding to those messages appropriately. Social media listening = Understanding your audience and improving campaign strategy by accessing the full spectrum of conversation around your industry, brand, and any topics relevant to your brand. 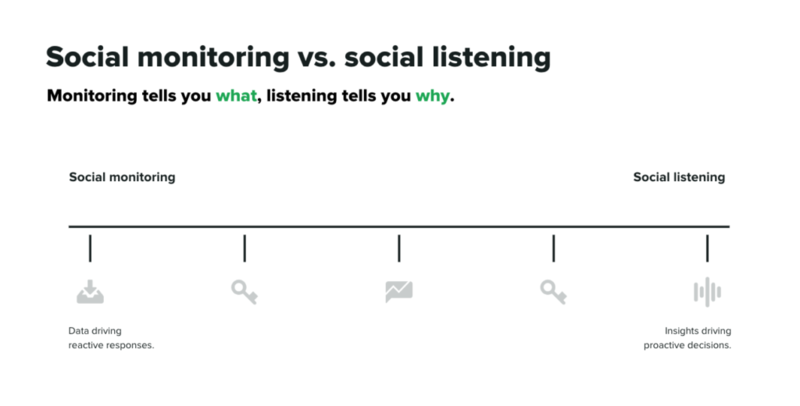 In essence, monitoring tells you what, listening tells you why. Monitoring addresses the symptoms, and listening reveals the root cause. Social media is the #1 channel for brands who want to connect with their audience. 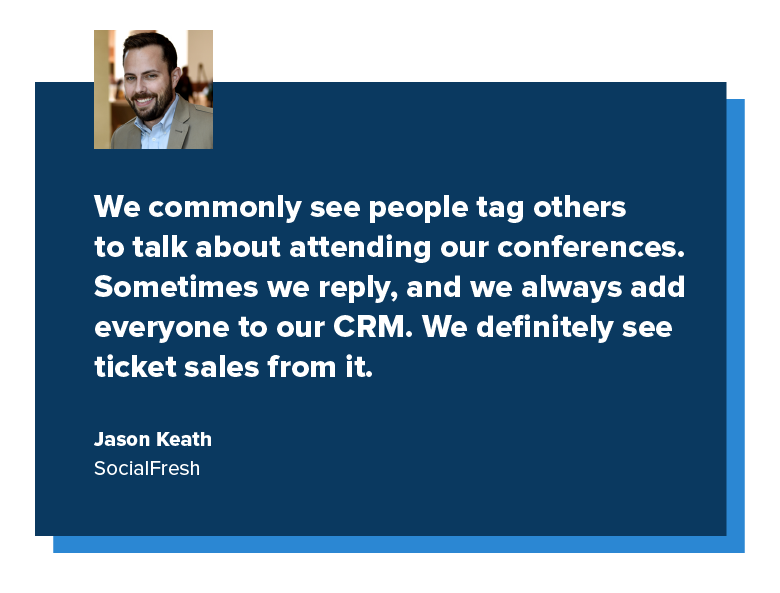 Social monitoring is the first step towards powering these connections, helping brands find conversations they can become a part of. That’s why social media monitoring is so important. Let’s say your brand is Best Yoga Pants in the World Inc. You want to know what people are saying about your brand, not just when they tag you on social, but when they mention you in any capacity. Social media monitoring tracks the key phrases and terms important to your company and surfaces them for you to respond to. This can also include that new Cool Yoga Tank that your brand released. And it can include an upcoming event you’re going to, running or just attending. Like the Best Yoga Conference in the World. By failing to monitor social media mentions—equivalent to ignoring the phone line—most brands leave behind important business intelligence that could inform more strategic decision-making. Monitoring therefore is essential to your brand’s communications pipeline. Your social media managers and customer care agents should own most of this interaction, essentially playing air traffic control to what’s coming in across your social networks. To ensure your social team is set up for success, consider a two-pronged approach. 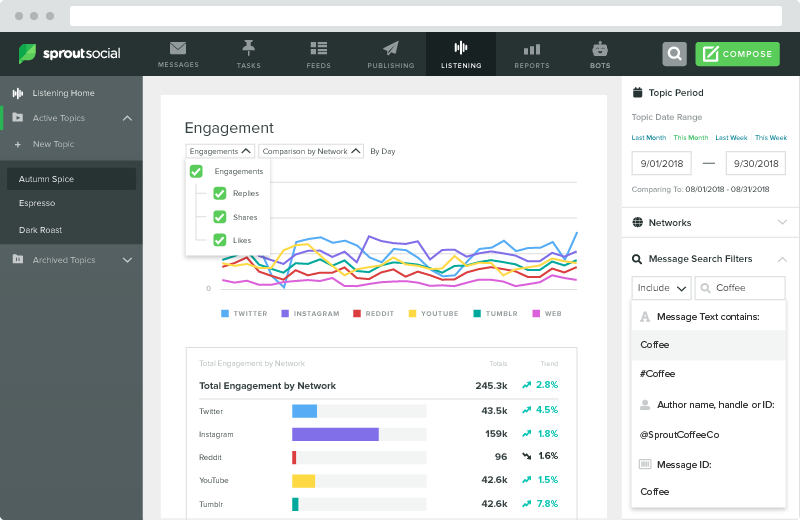 First, centralize your social profiles into a single platform that enables message monitoring at scale. Then create alerts to keep your agents apprised of instances where your brand is being talked about (either directly or indirectly). Include your brand’s handle and broader mentions. Also, account for common misspellings, nicknames, flagship products, and industry-adjacent terms. By receiving these alerts, your social team will be better able to block and tackle on your brand’s behalf, answering FAQs while routing other critical messages to different departments within your organization, from HR to sales. To get even more sophisticated, your community managers can also identify potential entry points to guide purchasing decisions. But be careful: This tactic is as much an art as it is a science. Social media listening refers to analyzing the conversations and trends happening not just around your brand, but around your industry as a whole, and using those insights to make better marketing decisions. Social media listening helps you understand why, where and how these conversations are happening, and what people think—not just when they’re tagging or mentioning your brand. This helps you form future campaigns, improve content strategy and messaging, outpace your competition, construct an effective influencer program and even build more impactful brand partnerships. Monitoring is the entry point. Listening is the graduate degree. While brands can certainly hunt and peck to engage in the most basic monitoring on native platforms, a comprehensive social listening strategy absolutely requires a third-party tool to analyze large volumes of data. Put another way: While you can look at trees one by one at the ground level, you need a helicopter to scan the whole forest. Executing a social listening strategy may seem more difficult than day-to-day monitoring, but it doesn’t have to be. Start with turn-key solutions, then progress to more intricate techniques. Powerful, automated listening tools that require minimal setup can deliver just as meaningful actionable data as customizable ones. For example, analyzing your brand’s @mentions on Twitter within a given timeframe and surfacing frequently mentioned hashtags, keywords, and associated terms can help you gauge sentiment and understand what people are saying about your brand, products, and campaigns. All this is possible without fine-tuning complex search queries or relying upon algorithmic sentiment triggers. Just simply listening to what is being said alongside your brand mentions is enough. However you approach it, the goal is to reach clearly defined outcomes within your brand’s larger social strategy. If monitoring tactics result in enhanced engagement and listening efforts inform more strategic decision-making, you’re well on your way to achieving resounding success. So let’s dive into how each of Sprout’s social listening tools can help you keep a pulse on your brand, competition and industry. 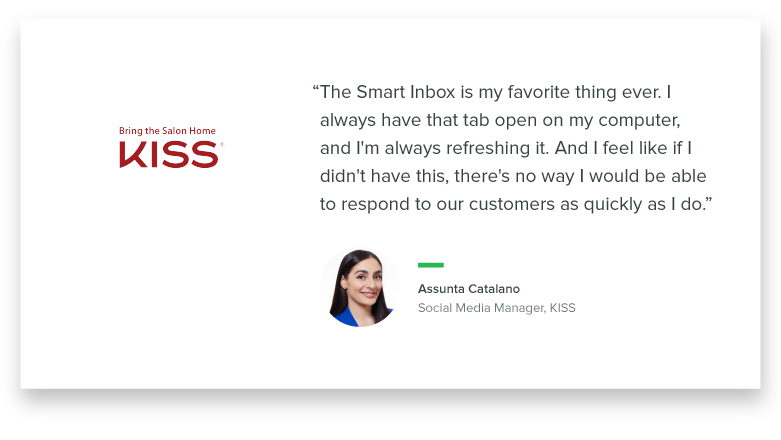 The Smart Inbox is the place to keep track of every conversation with and about your brand. It is the essence of monitoring, helping you to centralize and foster authentic conversations with action in mind. Messages from each of your social channels are centralized into one feed to make sure you stay focused and never miss a message. Brand Keywords help you capture more conversations that are relevant to your brand, industry or competition. This is a step towards listening as you go beyond just your brand with the ability to track a variety of topics. Brand Keywords are custom searches that run constantly and display results in your Smart Inbox, which you can interact with just like any other message. You are still focused purely on messages with the intention of responding or supporting on a personal level. If you aren’t actively searching for these types of messages, you may miss out on the chance to jump in on important conversations. The Trends Report automatically surfaces the most popular topics and hashtags mentioned about your brand. With the report we sit squarely in the middle of our spectrum. 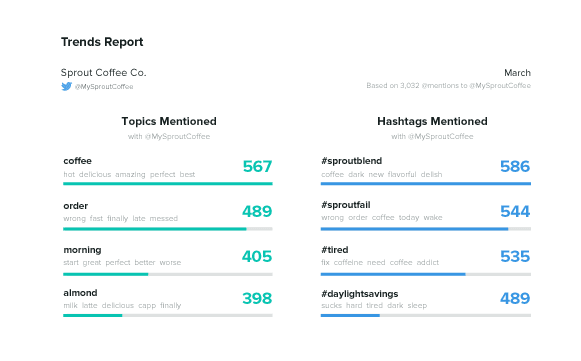 The Twitter Trends Report shows the hashtags and topics that are trending across the mentions and replies for your connected profile(s). It also shows the people and brands that most frequently talk about and get mentioned with your business. You can begin to zoom out a bit on the conversation around your brand to begin to identify trends around your brand or campaigns. 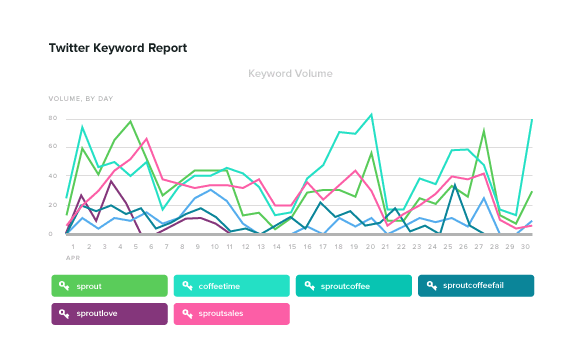 The Keyword Report reveals share of volume for basic keywords related to your brand, competition and industry. The Twitter Keyword report instantly uncovers trends in Twitter traffic for any keyword, hashtag or complex search query across any date range. With this report we start wading into Listening territory. No longer is the focus purely on individual messages. Instead you are focusing on bigger trends around certain keywords over time to determine campaign performance, keep tabs on your market, or discover patterns in keyword usage. Sprout’s Listening solutions offer a window into the candid thoughts and feelings of an audience in aggregate to illuminate trends, uncover patterns and gauge emotional response around any topic. It illuminates both broader trends in popular topics, demographics and influencers, while providing the flexibility to zoom into individual posts for qualitative insights. The insights illuminated here can power not just your social strategy, but overall marketing and even business strategy. Ultimately, knowing “why” is a powerful thing that requires an equally powerful solution. If you’re ready to start driving your strategy with listening insights or monitoring capabilities, request a demo of Sprout Listening here.